Our mission is to design one-of-a-kind wedding flowers that are a true reflection of you and your sweetheart, and we are honored to work with you closely throughout your planning process to design a beautiful, custom floral-filled wedding! Getting to know you, learning about your vision for your big day, working together to thoughtfully curate every floral detail, and being able to serve you on the best day of your life is such an honor! We travel to weddings all over Virginia and the Southeast, and we have designed florals for weddings in a variety of venue settings, including vineyards, wineries, private estates, upscale barns, historic homes, art museums and more! Hi, I'm Courtney! I've been happily married to my high school sweetheart for almost 3 years, and I can't live without vanilla lattes, fresh flowers, and our sweet dog, a goldendoodle named Violet. I love going to the beach, enjoying coffee dates with friends, and trying out new local restaurants! I live in Virginia, and I have designed flowers for weddings all over the state, and I also design destination weddings too! Courtney blessed my wedding with her knowledge of florals, understanding of different atmospheres, talent, and love for people. She honestly killed it!! Her passion is so clearly felt and seen. I entered my wedding ceremony space and while my groom took my breath away, the flowers made me weak in the knees. It only got better as she decorated the ballroom we had our reception in. I knew Courtney was talented, but she literally far out-passed the expectations I had! I especially made a friend out of all of this! She is so personable and listened during my mini-bridal moments. I am so glad I found her, and trusted her. The only thing I would change if I could would be to give her 6 STARS out of 5 for the value. Priceless! She knows what she is doing, and most importantly enjoys it. It shows! Courtney was an absolute dream come true! We had an outdoor ceremony and she literally transformed the space with her creative vision. Her florals - from the bouquets, table arrangements and installations - were jaw-dropping gorgeousness. Courtney was also so professional, very responsive and so easy to work with that I would highly recommend her services. I kept telling her I just wish I could have hung out with the flowers longer! They were THAT beautiful! 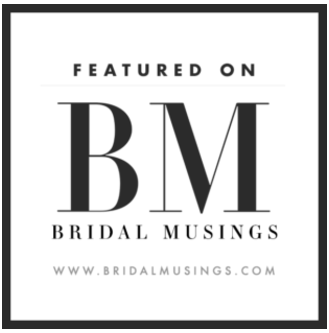 see more Kind words From Our Brides!